can i eat shasta daisy flower? 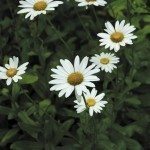 I want to plant shasta daisy. Can I eat the flower as a tea drink? Shasta Daisy flower and leaves are edible.